So after a lot of debating, I decided to add a border to my scenic BOM. I brought the quilt with me to several stores, unsure of what I actually wanted to use. When I came across this one fabric, I knew right away that it was the perfect border. I ended up making one for myself that I use for my rotary cutter and other tools when traveling. Both were made using just one Birdie charm pack. This one is mine since I gave mine to my mom for Christmas and didn't get a picture of it before I gave it to her. And here's the back of the clutch. Some of you may remember that I participated in Carol Doak's Scenic BOM last year. Well, Carol's back with another BOM on her Yahoo Group. This time it's a Simply Radiant Star BOM! 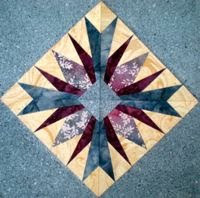 Every month Carol will post a new Simply Radiant Star block in the Yahoo Group. The pattern is free, so it's a great way to use up some fabric from the stash. I'm planning on using a fat quarter bundle for this quilt. Let me know if you decide to join. I'd love to see your blocks.